Catererin, Jiaying and Mohammed went to Dippoldiswalde on Friday evening to their first Peace Slam outside Dresden. The host of our School Slam yesterday was the Glückauf Gymnasium in Dippoldiswalde, which turned out to be a really great school with very committed students and an enthusiastic director. Normally we organize school slams with teachers, but this time it was different: Roland, a 17 year old student, asked his classmates to design a program together with us. In the school canteen, he issued a call to everyone who likes to write lyrics and songs in order to integrate them later into our program. The result was overwhelming. The students sang songs they had composed themselves, improvised their own poems on the piano, made their own cheeky slams and shared the answers of their classmates to the question “What is peace for you?” A peace guide on stage collected all these ideas and conclusions and will be a meta wall in the school auditorium for a while to remember this event. Mohammed from Egypt talked about his experiences in different countries and especially about his experiences with the topic of historical guilt. Jiaying from China told how it is to move from a metropolis to Saxony and talked about all the social pressure you are still exposed to from your home country. Caterin, Slammerin of the first hour, dared to perform her slam about the peace movement in Colombia for the first time in German language. All the excitement of the participants of this program, all their preparation and engagement with the topic finally contributed to an incredibly successful event. The headmaster of the grammar school said that this event is a great happiness because this is “school peace”. School peace for him is not something quiet, but something loud. When students take personal responsibility and organise such an evening, school peace is guaranteed. “Peace, self-initiative, creativity and cosmopolitanism become the cloverleaf of happiness.” We join in and appeal to all schools to follow Roland and the Glückauf-Gymnasium. We would like to thank everyone for their involvement in this project and express our respect for the group of students! 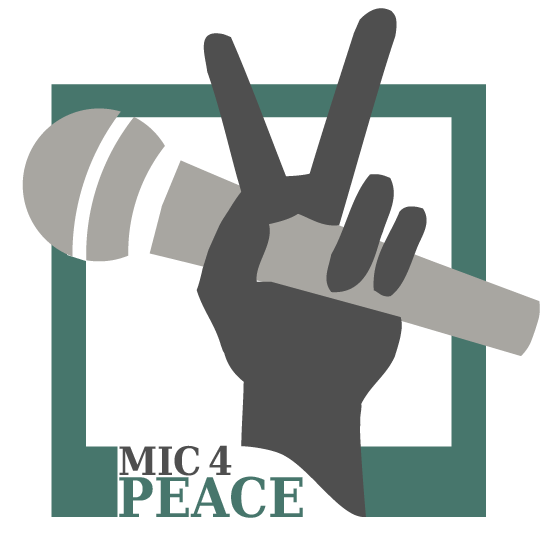 It is quite simple: contact us via mic4peace@gmx.net.